Shown above is the version with added video, which displays pages of text, photographs, family trees and all the other things you'd just love to browse through while sitting on your loved-one's grave. 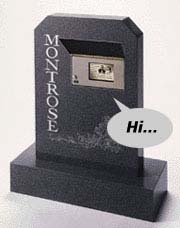 The price for this tasteful granite-and-bronze memorial? Just $4995.00 (batteries included).